SILVENT 209: used in most types of applications. Made of zinc with 1/4" male connection thread. 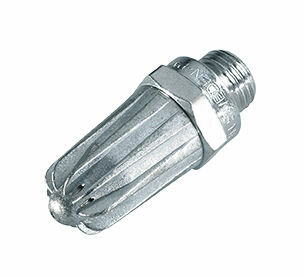 These nozzles have been installed in thousands of different applications throughout the world - applications where the noise level has been cut in half and energy consumption drastically reduced. The protective fins prevent direct contact between skin and the exhaust ports. 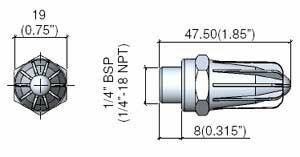 With this design, the nozzle fulfills the OSHA requirements of a dead-end static pressure of 210 kPa (30 psi) and EU Machine Directive noise limitations.